I've attended a half dozen or so musicals at Bloomington Civic Theater and have always enjoyed what I've seen, but I've never been to their Black Box Theater to see a play. Bloomington is a bit of a drive from my home in the Northeast suburbs, so it took a special play to get me there for a non-musical. That play is Proof, my second favorite math play (the first being Tom Stoppard's Arcadia). Of course it's not really about math; math is the backdrop against which a very real and powerful story about family, identity, and metal illness is told. It's a beautifully written play (by David Auburn), and director Alan Sorenson and his able cast do a good job of bringing it to life. I was wiping away tears at several points during the play, which speaks to the emotions in the written words as well as in the performances. 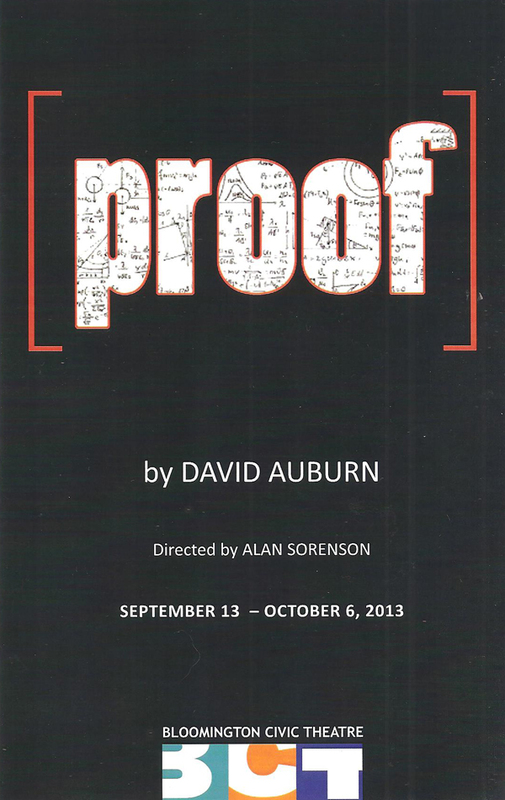 Proof premiered on Broadway in 2000 and won the Tony for Best Play. I saw it on tour in 2002, which is proof (sorry) of it's popularity since Broadway plays don't go on tour as often as musicals. It tells the story of a young woman named Catherine whose father, a renowned mathematician, has just died. She took care of him in the final years of his life as his mental health deteriorated. In that time he filled 100 notebooks with gibberish, or is it mathematical genius? Similar to the movie A Beautiful Mind (based on the biography of mathematician Jon Nash), he sees patterns and codes everywhere, and it's difficult to decipher the difference between madness and genius. One of his former students, Hal, comes over to the house to go through the journals to see if there's anything of value. At the same time, Catherine's sister arrives from New York and tells her she's sold the house, and wants Catherine to move to New York with her. When Hal discovers one beautiful, complicated, ground-breaking proof, Catherine says that she wrote it. No one believes her since she's had little schooling; she dropped out of college to take care of her father. It's obvious she has inherited her father's mathematical skill, but has she also inherited his mental illness? That's the question that Catherine struggles with as she tries to figure out who she is without her crazy genius father to take care of and define her life. This is Catherine's story, and Erin Mae Johnson is up to the task of conveying her varying emotions, from devastation at the loss of her father, to excitement at the possibility of new love, to betrayal when those closest to her don't believe in her. Scott Keely is excellent as her father, seen in flashbacks and hallucinations, becoming more and more unraveled as he descends further into his illness. Also good are Bailey Murphy as the businesslike sister who wants to wrap everything up neatly and move on with her life, and Zach Garcia as the enthusiastic math scholar Hal who befriends Catherine as he tries to glean something from what her father left behind. Proof is a fantastic play, emotional and powerful and funny at times, presented nicely by BCT. You don't have to be a math nerd like me to enjoy it, but if you are, you'll learn some interesting facts about prime numbers and mathematician Sophie Germain, and enjoy a few inside jokes, like the one about a song called i. 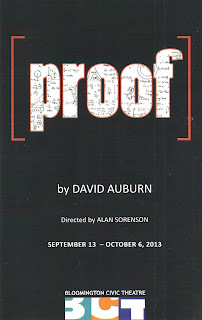 Proof is playing now through October 6 in BCT's Black Box Theater (discount tickets available at Goldstar.com).